The location on which this monastery has been built was significant even in prehistoric times. Excavations have revealed some of the oldest settlements in this region, dating back to the Paleolithic. The first church on this location was built in the 1500s. The establishment of the monastery here in the 16th century made it a place of renowned culture and science. Damaged by the earthquakes of the 19th century, the monastery was thoroughly repainted and rebuilt. Today, it houses the relics of Saint Nectarius the Thaumaturge. The bell tower is the highest in Romania at 25 metres. The decoration is sombre and majestic. Check out the Baroque iconostasis and the tombstones in the narthex. By Trans 23 and 27 stop Pasaj Marasesti. How popular is Radu Voda Monastery? 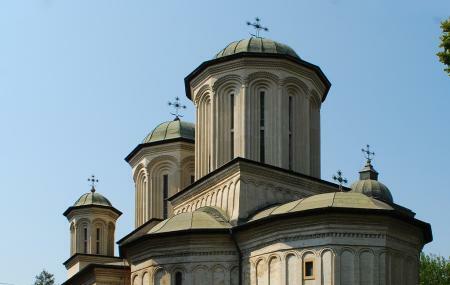 People normally club together Biserica Sfantul Gheorghe Nou and Constitution Square while planning their visit to Radu Voda Monastery. This sacred place is an oasis of tranquility when it is not populated by the envoys coming to pray. My work place was nearby and the bells beat my memories. Very beautiful place where you can pray and connect with God. More than 400 years of history, the big church surrounded by the park worth a short visit. It is a very nice and quiet orthodox oasis in the middle of Bucharest.